June 15, 2017 0 comments on "Canning Nectarine Plum Jam"
If you are looking for a new flavor of jam to try, then you definitely want to try canning nectarine plum jam. It is the perfect combination of nectarines and plums. Fill your boiling water canner about half way with water and place on the stove to start heating up while you get the fruit ready for the jars. To prepare the fruit, chop the fruit finely and then crush it with a potato masher. You need 3 3/4 cups of crushed fruit for this recipe. Put the crushed fruit and lemon juice together in a large sauce pan or stock pot. Stir in the pectin. Bring to a rolling boil that cannot be stirred down. Stir in sugar. Add 1 tsp. margarine or butter to reduce foaming, if desired. 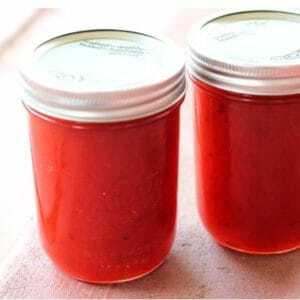 Quickly ladle fruit into prepared canning jars, within 1/4 inch from the tops of the jars. Wipe the rims of the jars with a damp cloth. Place canning lids and screw bands on the jars. Place jars on elevated rack in boiling water canner. Water must cover jars by 1 to 2 inches. Add additional water if necessary. Cover, and bring water to a gentle boil. Process jars for 10 minutes. Remove jars from canner and place them upright on a towel on the kitchen counter to cool completely. Do not disturb the jars for at least 12 hours. After jars are cool, check seals by pressing middle of lid with finger.